We have updated Friends Mural to 0.9.4. This version contains bug fixes and a display font option. Now you can choose the font for pictures on your mural. This is especially useful for people who have friends with non-latin names which cannot be displayed in the handwritten font. To find the option, right click on the Friends Mural icon and choose Options. Then choose one of the fonts in the list and click Save. It's done! @Mark Sorry about that, it is a long story. 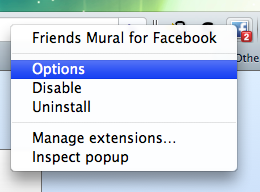 Friends Mural is taken down in Chrome Store months ago by a notice from Facebook and the app is disabled last week. Therefore, users can no longer use Friends Mural.